I decided to try henna because I wanted to color my hair but my mom wouldn’t let me use chemicals. I was going for a darker color than the red in henna. I used burgundy. I wanted the color to be darker but was pleased with the overall effect. I will definitely be using Henna Hut again. 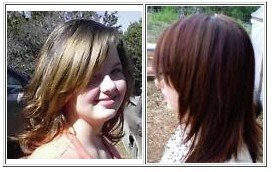 Sun light photo of before and after using burgundy on brown hair with blond highlights.